Just 170 km from Cape Town in the Overberg region in the Western Cape, on the way to the most Southern tip of Africa in Cape Agulhas, there’s Gansbaai. 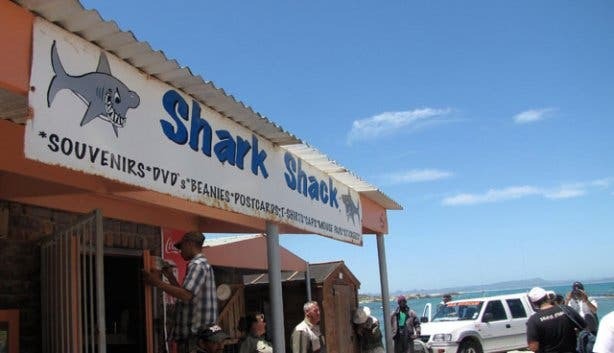 Gansbaai means 'Goose Bay' but here we talk sharks and not geese. 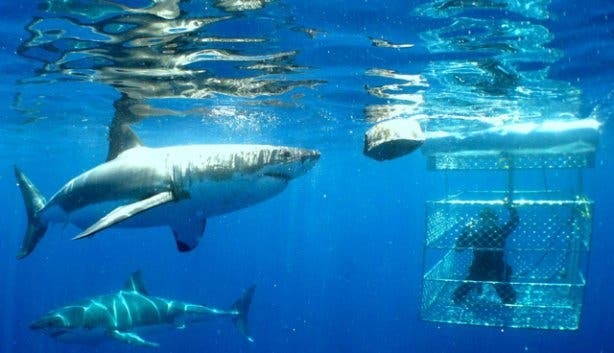 This small fishing village is the great white shark capital of the world and yes, the main thing here is shark cage diving. Dyer Island is the place where the extreme shark adventures happen. Sharks like this place due to its high population of seals. You can experience a scenic boat trip, watch the sharks from the boat and even meet them face to face in their own territory. 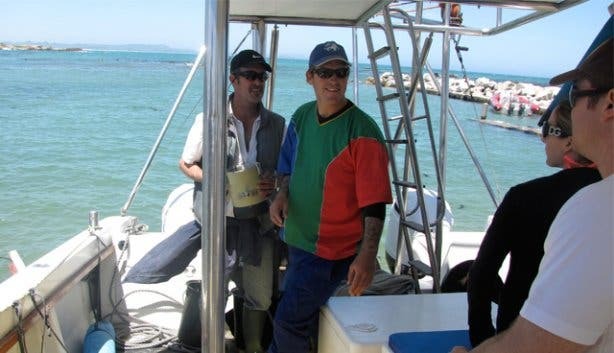 Before and after the shark cage dive, there’s more to discover in and around Gansbaai. Enjoy our tips! Gansbaai is definitely a place to switch off your cell phone and relax. The small, quiet coastal town lives off the sea, which means fishing plays a big role. Take a walk through the harbour and chat to the fishermen, buy some fresh fish for your evening braai or try your hand at catching some yourself. If you're feeling lazy visit one of the local restaurants for their catch of the day. Gansbaai is a crayfish town and there is plenty to go around during season. You’re not keen on getting close and personal with the sharks? No problemo, a boat trip to watch these magic creatures is equally interesting. Watch the whales from a boat or the shore, from July to November. Dyer Island has a large marine bird population including Jackass Penguins, Bank Cormorants, Kelp gulls, rare African Black Oyster catchers and various other marine birds. Rather stay on the shore? Enjoy peaceful walks on long stretches of sandy beach or settle down in the sun with your book. Swim in the sea (best from December to March) or hike along the cliffs and mountains in the fynbos (there are 1500 species to look out for). Enjoy the view and watch the sun set with a good bottle of wine. For the wild ones, there are 4x4 obstacle courses, caves to explore and kayaks to be paddled in. 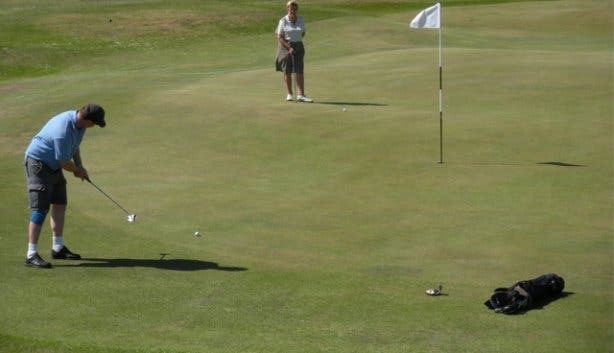 For the golf-players, Gansbaai has a nine-hole golf course, situated in picturesque Kleinbaai. Visit the Dangerpoint Lighthouse, built in 1895, as a result of the many shipwrecks along the coast. A memorial to those who lost their lives during the sinking of the Birkenhead troopship can be seen here. Many of the artefacts from the Birkenhead are housed in the Strandveld Museum in Franskraal, seen as one of the quaintest museums in the country. An original "Strandveld-house" holds a special collection about the history of the area. The bi-annual “Spooktoere” or ghost tours are legendary and something to put on the “to-do-list”! Baardskeerdersbos is home to the famous Baardskeerdersbos Orkes (orchestra) and a drive through this hamlet will take the visitor back in time. The neighboring village of Elim is an old Moravian mission station, established to function as a refuge for Khoi-people (the indigenous inhabitants of the Western Cape) in the 18th century. Visiting Elim is almost a time travel to the 19th century. There is a monumental church, a working water-mill and the only monument to celebrate the abolition of slavery in South Africa. If you have had enough of Gansbaai, head out in the easterly direction to Bredasdorp and from there to Swellendam and onwards to the Garden Route or the Karoo. More to the east is Cape Agulhas, the Southernmost point of the African continent and the meeting place of Indian Ocean and Atlantic Ocean. The newly established Agulhas National Park, stretching from Agulhas in the east to Buffeljagsbaai in the west is a sanctuary for several rare and endangered species of the Cape Floristic Region. The Victorian village of Stanford lies 24km from Gansbaai in the direction of Hermanus, it's located on the Klein River estuary and is a birding hotspot of fame with over 300 different species. Stanford also has some good restaurants. Take some time in Gansbaai and enjoy nature to its fullest! We agree with what the Getaway Magazine said about Gansbaai: "This, truly, is the gem of the Overberg." 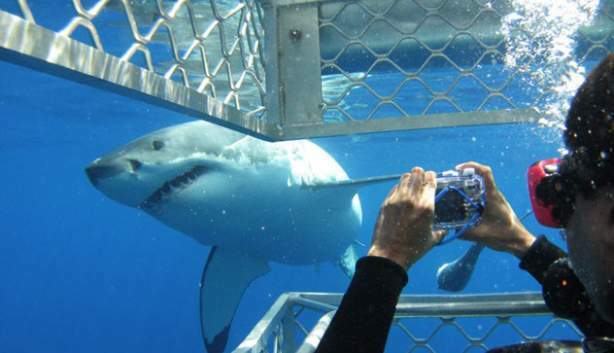 Read more about shark cage diving in Gansbaai. Subscribe to our monthly free newsletter and find us on Facebook and Twitter.